“Now I feel confident I can do it!” commented a new student after my workshop. 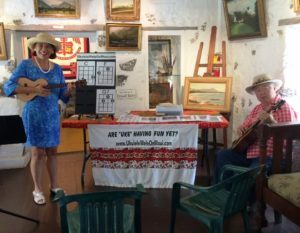 Five out of eight people who pre-registered for my ‘Ukulele Strumming Workshop showed up on October 21, 2017 from 10 a.m. – 11 a.m. at Hale Ho’ike’ike at the Bailey House in Wailuku. Two of the participants live in California and had attended workshops and private lessons in the past. We started the sixth season of workshops with a change in length from 2-hours to 1-hour and kept the fee unchanged at $10 or $5 for museum members. This brings the total to 520 participants since the first workshop began on July 14, 2012. Happy Birthday – 3 chords with up and down Chalang-Alang strum. Plus, I demonstrated other strums to the same song and how applying the different rhythms affect the mood of what you want to express. In other words, there is more than one way to play a song and you are in the driver’s seat to convey the feeling by the way you play the strum. After the workshop, I found out that two of the local residents were age eligible for Kaunoa Senior Center and so I told them how to sign up for the monthly newsletter with over 12-pages of activities to choose from. My next beginner ‘ukulele classes at Kaunoa will start in January 2018. Click here to visit my Kaunoa webpage of classes offered for adults 55 and better. Register now for the next Ukulele Strumming Workshop on Saturday, November 18 at 10 a.m. at the Bailey House in Wailuku.